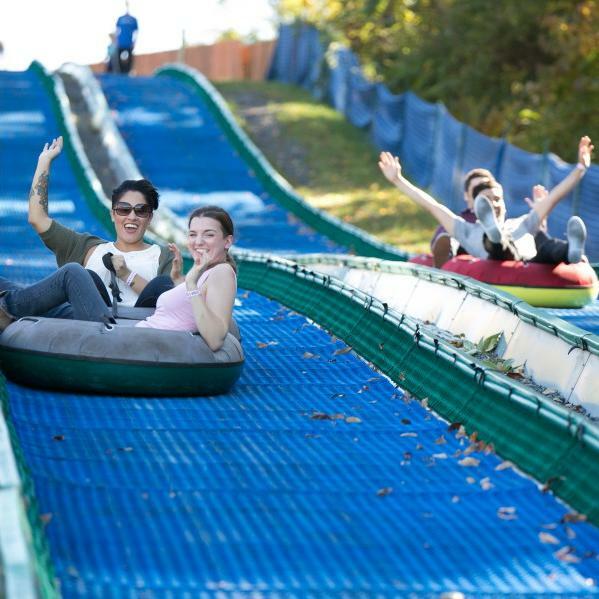 Blue Lightning Tubing is located on the slope that is home to White Lightning Snowtubing in wintertime, using the same Magic Carpet lift to ride to the top of the slope. The park allows guests to experience the thrill of tubing throughout the year on lanes made of a blue synthetic turf-like material. It is easy to do. Customers ride the lift up to the top then glide down in hard bottomed tubes that are lubricated for an exhilarating experience much like sledding but in a tube without snow or water. The Villas and Fernwood Resort Blue Lightning Tubing packages start at $181 a night midweek for a two-night studio villa and include two tickets to Blue Lightning all-season tubing. There are lights for night tubing throughout the summer. There will be special events such as Frugal Fridays, movie nights, karaoke, Pocono Comedy Jam on Saturdays, and specialty nights such as Pasta Night and Caribbean Night with a live band. Guests of the resort have preferred pricing for other resort amenities such as Pocono TreeVentures, Pocono Zip Racer, canoeing on the Delaware River, horseback riding, paintball, massage, and discounts to nearby attractions such as Shawnee Mountain Festivals and Bushkill Falls – the Niagara of Pennsylvania both located just minutes away. Blue Lightning is open daily beginning June 19. It is located on Route 209 next to the Tree Tops and Fairway timeshare villas. Bertucci concludes, “Tubing is one of our most popular attractions. With the addition of Blue Lightning, we can now offer it year round.” For Blue Lightning information and reservations, go to BlueLightningTubing.com.